Editor’s note: Matt Turck is a managing director of FirstMark Capital. Follow him on Twitter @mattturck. The concept of the Internet of Things is not new (the term itself was coined in 1999), but it is now in the process of becoming a reality thanks to the confluence of several key factors. First, while still challenging, it is easier and cheaper than ever to produce hardware – some components are open sourced (e.g. Arduino microcontrollers); 3D printing helps with rapid prototyping; specialized providers like Dragon Innovation and PCH can handle key parts of the production process, and emerging marketplaces such as Grand St. help with distribution. Crowdfunding sites like Kickstarter or Indiegogo considerably de-risk the early phase of creating hardware by establishing market demand and providing financing. Second, the world of wireless connectivity has dramatically evolved over the last few years. The mobile phone (or tablet), now a supercomputer in everyone’s hand, is becoming the universal remote control of the Internet of Things. Ubiquitous connectivity is becoming a reality (Wi-Fi, Bluetooth, 4G) and standards are starting to emerge (MQTT). The slight irony of the “Internet of Things” moniker is that things are often connected via M2M (machine to machine) protocols rather than the Internet itself. Third, the Internet of Things is able to leverage an entire infrastructure that has emerged in related areas. Cloud computing enables the creation of “dumb” (simpler, cheaper) devices, with all the intelligence processed in the cloud. Big data tools, often open sourced (Hadoop), enable the processing of massive amounts of data captured by the devices and will play a crucial role in the space. Unlike the Big Data space, where the action is gradually moving from core infrastructure to vertical applications, the Internet of Things space is seeing a lot of early action directly at the vertical application level. Some notable players like Nest Labs seem to have adopted a deeply integrated vertical strategy where they control key pieces of the product, including both hardware and software, in order to have complete control over the end-user experience (a lot like Apple, which is not surprising considering the founders’ background). Beyond the Nest, home automation in general has become the central battlefield of the Internet of Things, with some of the most exciting startups in the space jockeying for position. Another hot consumer-facing area is obviously quantified self, which is playing a huge role in developing consumers’ awareness of the potential of the Internet of Things. Beyond consumer, B2B/enterprise vertical applications of the Internet of Things, fueled in part by robotics, hold considerable promise in a number of areas such as manufacturing, transportation, healthcare, retail and energy. 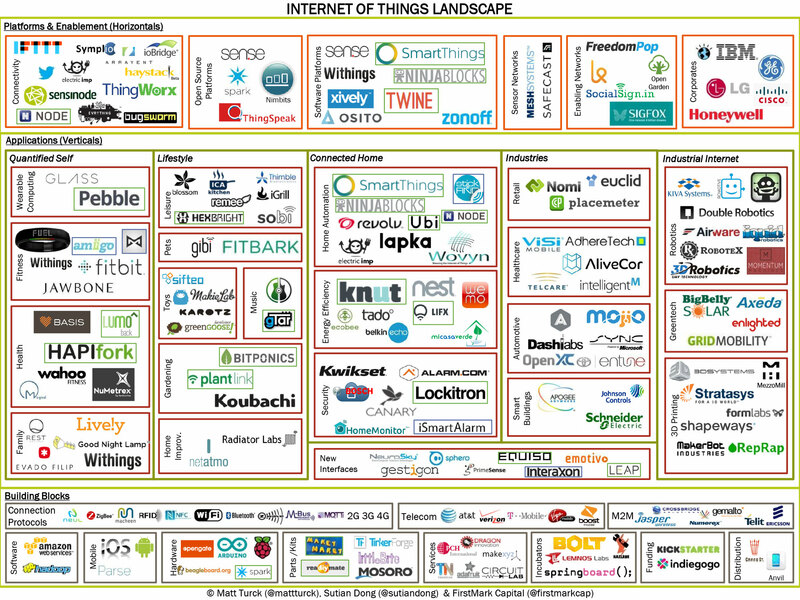 Some of clearest revenue opportunities for IoT startups are in the enterprise area. While a lot of the action is happening at the vertical application level, the ultimate prize for many ambitious players in the space is to become the software platform upon which all vertical applications in the Internet of Things will be built. For example, several of the home automation providers (SmartThings, Ninja Blocks, etc.) also provide a software platform, and seem to be leveraging their vertical focus as a way to kickstart activity on the platform. Large corporations (GE, IBM, etc.) are very active in the space and are developing their own platforms. Carriers (AT&T, Verizon) have a large opportunity in the area, as well. One open question is whether a platform developed for a vertical will easily translate to another vertical. In addition, whether the winning platforms are open or closed will play a huge role in the future of the space. My bet would be on openness. The related area of connectivity (connecting objects to the network/Internet and to one another through all sorts of rules) is also a very significant opportunity. The space is extraordinarily exciting, but still very much in its infancy – expect this chart to change dramatically over the next few months and years.